We love Micro Four Thirds cameras. We use them almost daily. But as nifty as high quality interchangeable lenses are, the big eye on a small body can be awkward. Not anymore. The Lumix's newest lens retracts like magic. 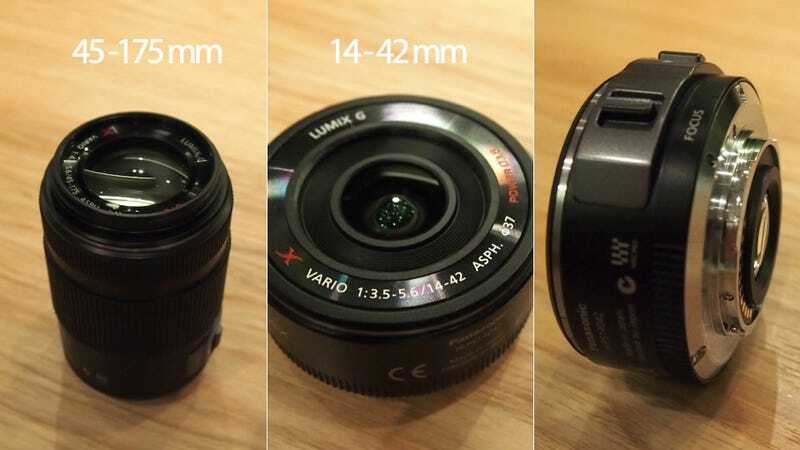 Available as a $750 set (badged the Lumix GF3X) paired with the stellar GF3, the 14-42 mm Lumix G X Vario lens looks like your typical fixed pancake lens—it's flat. Which is great if you're interested in stowing it away. But inside that pancake is a full, electronically-controlled zoom lens, that telescopes outwards with a shift of a built-in tab. The re-positioned zoom and focus controls might take some getting used to, but putting a zoom lens in a slim body is a game changer: Micro Four Thirds just left its awkward stage. And this isn't just a convenience add-on—Panasonic's billing the X series as its highest quality offering, with a proprietary anti-glare coating, built-in image stabilization, and a build quality that surpasses Leica's certification process. There's also a big brother in the line—a fully extended 45-175 mm zoom lens that doesn't retract, but has the same terrific, snappy optics as the little guy. Both lenses look and feel grand, and operate tremendously quick. As mentioned, adjusting focus and zoom with a different part of your hand takes some adjustment, but I liked it quite a bit. You may not. The tiny retractable version—easily the coolest lens I've seen in some time—will be available paired with a GF3 for $750 in October, or $400 on its own. The 45-175 mm version will cost $450 this September. Both, of course, are interchangeable with other compatible Micro Four Thirds lenses, no firmware update required. but in a smaller design that makes it extremely mobile." approximately 0.1 second – making it an extremely quick and high-performing digital camera. available with a manual focus lever for even more precise control. precise Contrast AF system and quick response times. The LUMIX GF3 is also capable of 1920 x 1080 Full High Definition video in the AVCHD format.